About once a week, Dan makes a honey glazed chipotle rubbed chicken that we usually put ontop of a mixed green salad. It’s delicious, healthy, and a totally original Dan recipe. As I mentioned in my last post, Dan and I spent all of this past Sunday figuring out how we could go about opening our cafe “On the Water” in Morehead. It’s a seven hour drive from Morehead back to Takoma Park, so we had a lot of time to brainstorm, and even went so far as to come up with a menu. We wanted to include the chicken I’d been calling “fire in the hole,” but didn’t think that the salad was a menu-worthy recipe. We’re really only putting our top contenders up there, and the salad wasn’t cutting it. So, we decided to adapt it into a sandwich. Because the chicken is heavily glazed, we needed a thick bread. 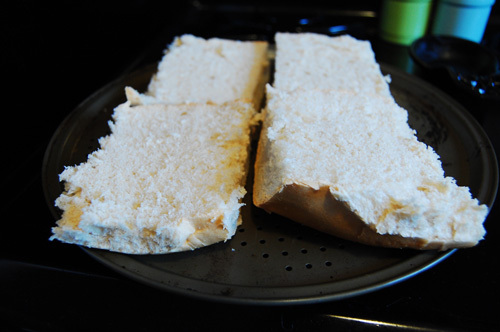 I hate when the ingredients in a sandwich dissolve the bread and it all sort of spills out. So we chose french bread. We also needed to do something to cut the spicy. See, the way that this chicken operates is that when you first put it in your mouth, all you taste is the sweetness of the honey. Then, as the honey glaze dissolves, the kick of the chipotle hits you, and your mouth is on fire. So we wanted to add a creamy cheese, something that could compliment the chicken but take away some of the after-effects. We juggled a few options, and decided on havarti. Finally, we wanted to add something leafy that would bring a freshness to the table. We’re big fans of the way that cilantro plays on other flavors, bringing a sweetness and a freshness into dishes that you can’t find in other fresh herbs. If only cilantro weren’t such a pain to grow, we’d grow pots and pots worth of it to keep it fresh around the house all the time. It really does do great things for this sandwich. In fact, the next time we make it, FiYHS 2.0 if you will, I think I’m going to add more cilantro. This sandwich really is delicious. For a 1.0 version, it’s top notch. I would make a few changes. It was a little cheesy and a little bready. I think I would hollow out the roll a little so it was just a tad less bread, and use one slice of cheese per sandwich instead of two. I would also, as I mentioned, add a little more cilantro. I really do think it’s going to be a big hit. Pat your chicken dry on both sides and rub with chipotle, salt and pepper, and cinnamon. Heat 2 tbsp oil. Stir in garlic powder and hot sauce. 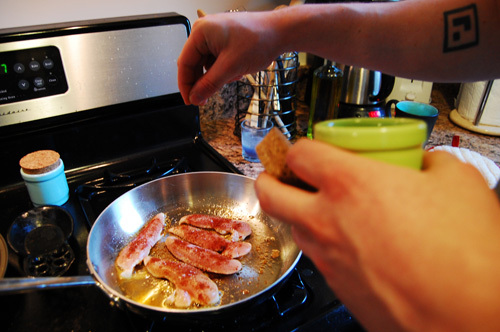 Place your chicken in the pan and cook five minutes. Flip and cook a additional five minutes. 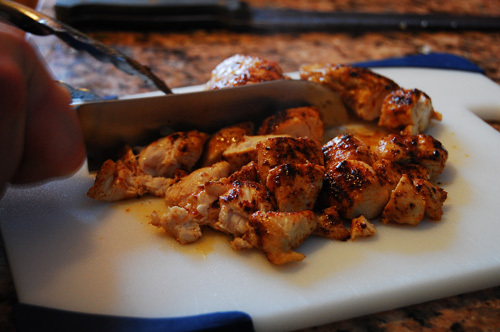 Remove your chicken from the pan and slice into chunks. Return the chunks to the pan and cook an additional two minutes. 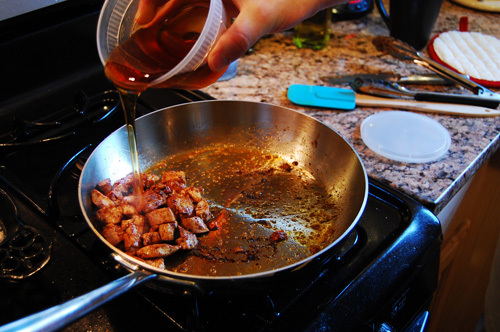 When your chicken is fully cooked, pour honey into the pan. The honey will melt, and then sizzle. Allow the honey to reduce. While the honey is cooking, slice your bread. 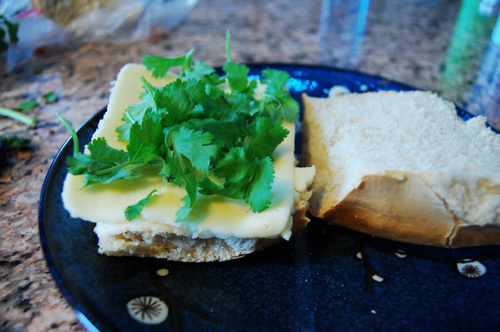 Top with havarti and cilantro. 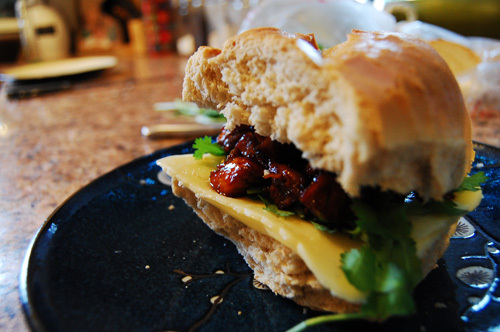 When the honey has completely reduced, place the chicken into the sandwich and serve. As the official Biscuits and Such dishwasher I’ll add some notes to make the inevitable clean-up easier. I like to blacken the chicken before I flip it over. This can result in some pretty hefty build up in your pan so when I put the chicken chunks back in I push them around with some pressure. It’s also pretty helpful to get water in the pan right after you’ve served the dish as the reduced honey is super sticky and can be a royal pain to get out. That looks delicious, I’m definitely going to have to try it soon! After having this recipe bookmarked for months, I just made the chicken and put it over a salad. All I can say is WOW!